One of the highlights of the Detroit Auto Show was seeing the three existing Equus Bass 770s up close. And one of the biggest mysteries of the show was why Equus wouldn't reveal who was in charge of the company, saying only that it was a "European businessman." I wanted to find out who it was. Spoiler alert: I did and it's unbelievably weird. The result I got incorporates many elements I'd never have guessed based on the car itself: Nigerian soap, trans-Indian trips, an overarching philosophy of global citizenship that feels a bit like the ham-fisted moral to some Saturday morning cartoon from the early 90s, and some pretty bad world music. Low-volume, high-end cars like the Equus Bass tend to be very personal things, representing the culmination of one person's dreams and vision of what an ideal car should be. That's why I wanted to know who was behind Equus. The car is distinctive in a very specific way — it's clearly a love letter to American muscle cars, with a strong emphasis on early Mustangs. 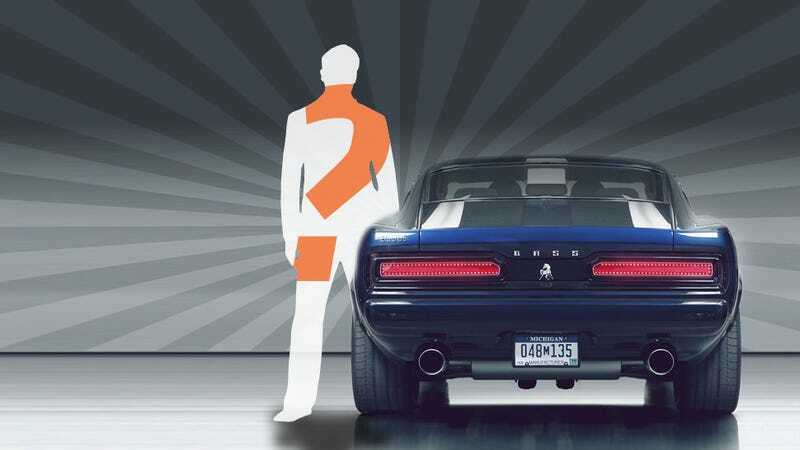 That person with the vision of a modern take on the American muscle car is a man named Bassam Abdallah. And the car is just part of a much larger, very unexpected plan. Oh, and it also reveals the origin of the car's name, Bass. Bassam. Bass. I get it. Equus Automotive, as I mentioned, will not tell you who runs the company. I called them up, and just like when I first asked, I was told it was a "European businessman." When I pressed for the reasons why this was, Michael Ouslid, whose business card has the exciting title of "Homologation," told me that at this point all the focus should be on the car. He went on to insist that revealing the "human story" would prove a distraction, and at this point they were very interested in the car being seen on its own merits and without "distractions." Distractions like a a music video shot on top of the Capitol Records building and grand, fuzzy dreams of everyone loving one another. Even so, he did confirm that Abdallah is the man in charge when I revealed that I knew the name. The first hint we got as to who ran the company came from an anonymous email telling us to look at the Bimbo corporation, that baked-goods company with the teddy bear logo that's big in Mexico. Searches among executives of that company proved a dead end, until by chance I found that the "Bimbo" name is used on another product as well: a Nigerian-market soap. ... and that's when I knew we had our man. Sensitive to the changes affecting the entire world today, especially in these times of crisis, and directly concerned with multiple inter-cultural exchanges, EQUUS-World is developing a global vision of the world through various segment: its events, medias (cinema, music, "Citizens of the World") and automotive (Dream On Wheels (DOW)). So, it seems that cars (or, Dream on Wheels, it seems) are one of the prongs of the hurled trident of a "global vision of the world," the other two being "events" and "cinema." Our adventure which I call Maharajah of the Road is drawing together citizens of the world who are bound by a similar passion, a passion not limited by age or gender or place of birth, but rather a passion fed by the desire to live the adventure that was the original Maharajah of the Road. The first glimpse of that passion was seen in the classic 60's and 70's Ford Mustangs and drew on my personal collection for a journey across the Indian continent. Renowned designer Tom Tjarda was commissioned to design two special cars named Equus MR (TOM1. and TOM2) to celebrate the timeless appeal of the Muscle Car Era and to take part in the journey. Those two custom Mustangs mentioned there, TOM1 and TOM2, were created by legendary designer Tom Tjaarda (who's work includes such diverse cars as the Ford Maverick, De Tomaso Pantara, and the back of the VW Type 34 Ghia) and can be thought of as the predecessors to the Equus Bass 770s we just saw in Detroit. The Tjaarda cars share the modernized Mustang ideals of the Bass, both mechanically and aesthetically. When it came time to start developing production cars and deciding how to build them, Abdallah entered an agreement with Georgia-based low-volume sportscar builder Panoz. The deal was celebrated with Abdallah's gift of a genuinely bonkers solid gold Mustang with diamond headlights. Classy. The Panoz deal soured, and today Equus claims that none of the development for the Bass 770 was done by Panoz at all. No chassis work, no body design, nothing. They also claim all design was done in-house, and are not based on the work of Tom Tjaarda's previous custom Mustangs. Speaking with Equus' representative on the phone, the tone regarding Panoz was one of dissapointment, with Equus stating that all of Panoz' work "had to be done over." I talked to Panoz, and there's no hard feelings on their end at all. The original company Equus worked with, Panoz Auto Development, is gone, and they confirmed that the current Equus has no Panoz development. The Panoz representative mentioned that he knows Bassam personally, and even attened one of his European Maharajah of the Road rallies. He went on to say that Abdallah is a very shy, private person, and runs the company from afar. He also said he's just a lover of American muscle, and wanted to know why no company was producing high-end, low volume muscle cars in America. That was the original impetus for creating the company, and the Panoz rep referred to the whole endeavor as a "gentleman's dream." He had no knowledge of any of Abdallah's muscial or philospohical goals. The development of the Equus Bass from this origin makes sense enough. A deliberate effort was made to lessen the most obvious Ford Mustang influences on the design, and if you look at Abdallah's collection of other American muscle cars, you can see where the various other details of the car were sourced. Though I think it could use a little more Marlin. The origins of the car itself make sense — a challenging rally in vintage cars, well-established designers, lots of mentions of Bullitt and a real passion for the whole American muscle car aesthetic — but the conversation keeps coming back to Abdallah's larger vision of global citizenship and that song. There's nothing inherently wrong with remembering that all people and cultures share a planet and it's probably a good idea to love everyone and all that — but it is sort of a stretch to keep forcing vintage/modern muscle cars into this paradigm. Bassam has a vision. He feels like these are beautiful things, especially since they're made by hand, they're someone's passion. If it were just a car rolling off a factory, I don't think he would feel the same. Maybe it's not so much the car that brings people together, but the idea that someone has a passion for something. Driving across India in this classic American car somehow means something about how every culture — it comes back to the feeling of the song. Another stumbling block was that we had been told the whole time that the song was for a car. We wrote a song called "Driver, Please." I turned it in, and Spencer's like, "You're not getting it." I'm like, "What is this song for? Does it exist outside of selling a product?" And he was like, "It does." And I'm like, "Well, I wish that we hadn't been talking about the car this whole time." That was the eureka moment. ... which suggests that at least the original direction was to write a song about the car. Is this clumsy marketing or something more earnest? I'm inclined to think that Abdallah genuinely and passionately believes all of what's described on his site, even if it does feel a little borderline new-agey cultish at times. I mean, it's just a song with cheesy lyrics that nobody's ever heard and I've yet to hear about any "international humanitarian vision." I can understand why Equus may not want to play up these behind-the-scenes goals and ideas, especially since the target market for an expensive, very American-inspired muscle car is not likely to be made of people who are huge World Music fans and long for the day when all the peoples of earth can come together in one vast hug. Right now all you can do is purchase the ninety-nine-cent song. It's still kind of abstract; it's like we're selling an idea. Apparently they can't actually sell the car yet — there was an issue with the engine or something like that, and it stopped production. I think Bassam is holding back a little bit because he still sees the song as connected to his other venture with Equus. He doesn't want to have it all come out now, and then not have it be connected with the car he's trying to sell. Because he's not going to make his money back selling a ninety-nine-cent song. And he dropped a lot of cash on this. That statement makes it sound a bit like he's hoping to tie the philosophy and associated music, culture, etc. with the car itself, because he feels that's more lucrative. But this is all just speculation, really. I don't want to be too judgmental about any of this, even if the somewhat cloying aesthetic and tone of everything does creep me out a bit. Abdallah could easily have a genuine interest and plan to help the world, and he certainly seems to be a dedicated and focused gearhead. I'd love to drive the Bass 770 for myself, too, and see what a $250,000 modern Mustang feels like. But I can't help being at least a little taken with the novelty of an American-styled muscle car being built by a Lebanese-born Nigerian detergent mogul with a passion for feel-good global music and a vague but strangely ambitious overarching philosophy of inter-cultural relations. I'll be the first to admit, it's not what I was expecting.